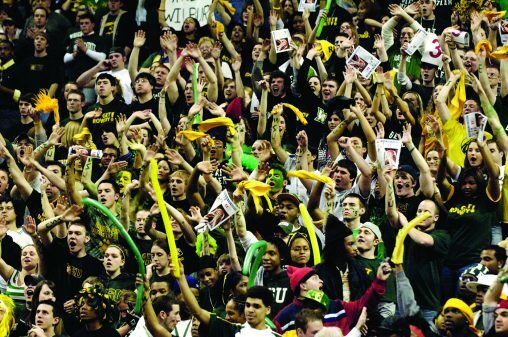 Wright State continued to find success in the 2000s through financial growth and more student success. In 2000, the College of Liberal Arts hosted the first ArtsGala, which celebrates the achievements of students in art, dance, music and theatre and motion picture programs. After 18 years, ArtsGala has raised more than $2 million for scholarships for fine and performing arts students. Liberal Arts was not the only place the university was thriving. The College of Engineering and Computer Science received a WorldMark 4800 computer from NCR, a donation worth $1.2 million. The new technology system could hold over 40 million webpages or three floors of a library’s worth of journal articles. One of the most robust computer systems of the time, the WorldMark 4800 was used for a variety of Wright State research projects, such as processing medical images relating to skin cancer, emerging patterns in customer purchasing trends and analyzing what human gestures, speech and gaze can tell us about the workings of a human mind. In 2001, Wright State launched its fundraising campaign Tomorrow Takes Flight Campaign. By 2006, when Tomorrow Takes Flight ended, the campaign had raised over $120 million, far exceeding the $40 million goal, and enabled the university to create 200 new scholarships and five endowed chairs and professorships, as well as the naming of the Raj Soin College of Business and the Boonshoft School of Medicine. Also in 2001, Kaplan/Newsweek College Catalogue recommended Wright State for its “high level of individual attention from faculty.” In the same year, the College of Nursing and Health received its first National Institute of Nursing Research grant. Wright State students began a five-year streak of placing in the top 10 at the National Intercollegiate Ethics Bowl in 2002. The educational goals of the Ethics Bowls are to improve moral leadership reasoning skills in a team context and to develop persuasive oral argumentation skills necessary for professional leadership and public accountability. To assist students who have difficulty reading text because of a visual impairment, Wright State developed Talking Signs, which consisted of infrared transmitters that “read” signs out loud. Wright State implemented a new five-year strategic plan in 2003 that sought to define the university’s role in the world. The plan provided future direction for the university as it continued to grow and thrive. Wright State received its largest private gift to date — $28.5 million — in 2005 from the family of Oscar Boonshoft to upgrade the School of Medicine. This gift helped the medical school expand its facilities, fund scholarships, accelerate research and develop innovative programs in global health and geriatric medicine. Following a July 31 Convocation Ceremony, the school formally adopted its new name — Wright State University Boonshoft School of Medicine — in a ceremony honoring the Boonshoft family’s extraordinary generosity. Students from Wright State won the national accounting competition for the fifth time in 13 years. This was previously unheard of, as no other college has won the competition more than twice. 2006 saw the opening of the MTC Technologies Trading Center, a state-of-the-art simulated financial trading center, in Rike Hall, and the Joshi Research Center, which hosts the Appenzeller Visualization Laboratory. The laboratory supports large-scale visualization and fully immersive virtual reality equipment. Wright State University became the first university in the nation to create a park specifically for service dogs when the Wingerd Service Dog Park opened in 2008. During the same year, U.S. News and World Report named Wright State one of America’s Best Colleges. Continuing its success in other areas, Wright State was named a Military Friendly School by GI Jobs and Military Advanced Education, Best Business Schools by The Princeton Review, President’s Higher Education Community Service Honor and among America’s Best Colleges by Forbes in 2009. The Lake Campus completed a $9 million renovation in 2009, including opening the James F. Dicke Hall, a multipurpose center. Originally founded as a branch campus of The Ohio State University and Miami University, Wright State became an independent institution in 1967. It celebrates its 50th anniversary in 2017, culminating with a special Homecoming celebration Sept. 29 through Oct. 1.